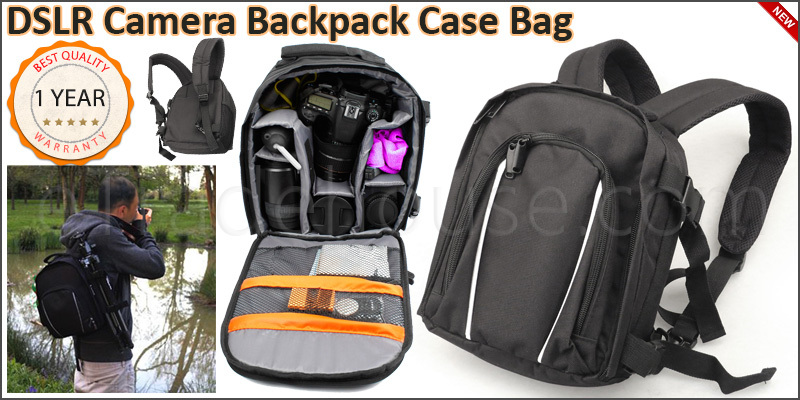 This Deluxe DSLR SLR Camera Bag is very useful to prevent your precious camera equipment to knocks and scratches that can damage your camera.This back pack will extend the life of your cameras accessories. This sack is rain proof and the added rain cover will protect your equipments, so you can carry this bag without any fear of water damage. This bag features an adjustable Muti-Section divider system which separates, organizes and protects lenses, flashes and other accessories to suit your particular needs. Superb case ideal for comfortably carrying heavy SLR or DSLR digital cameras, lenses, flash guns etc. Padded dividers give versatile layout options for extra bodies, lenses and flash guns etc. Rucksack with five adjustable hook and loop inner dividers. Various mesh pockets in the lid and in the front pockets. Interior dimensions: 20 x 10x25 cm. Twin Back /Shoulder straps (length can be adjusted). Extra comfortable wide padded shoulder straps and breathable fabrics for maximum comfort levels.